Customer calls for boycott of NYC restaurant after a racist slur was left on her receipt. Racism is everywhere, even in the blue liberal bubble that is New York City. 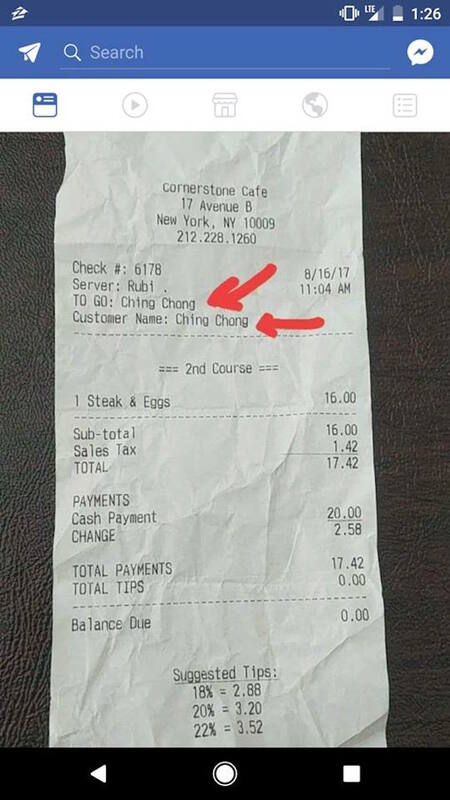 According to a Facebook user named Ziggy Chau, an employee of Cornerstone Cafe in Manhattan's ultra-trendy East Village used the racial slur "Ching Chong" on the receipt of an Asian woman who ordered steak and eggs. "This just happened to my friend's mother...right here in NYC!! 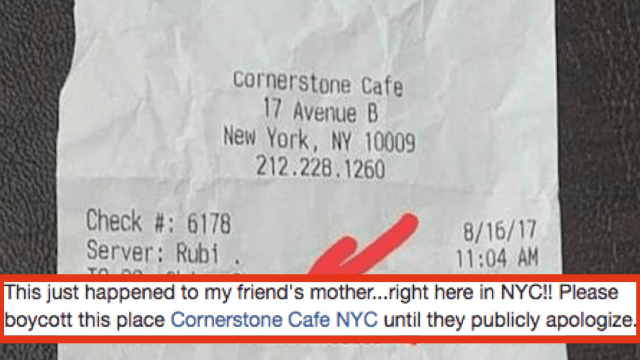 Please boycott this place Cornerstone Cafe NYC until they publicly apologize. Better yet, call them directly and let them know they have a racist staff," wrote Chau in a message accompanying a picture of the receipt in question. "Racism has no place ANYWHERE. Asians friends----- speak up for ALL... not just when it affects you, please." My friend didn't want to make a big deal of it. I just took it upon myself to at least call the restaurant and speak to the manager and let them know this happened. I explained the situation to the manager by the name of Rocco who then proceeded to ask me so what is the customer's name then? I said irregardless, the receipt said Ching Chong, a derogatory term for Asians. He made an excuse and said maybe the server misheard the name. I said the receipt is being shared on social media and his restaurant should respond to it. I asked him to issue a public apology on their social media channels so we shall see what happens. I am sure not everyone that works there is racist. I don't want innocent people to lose their jobs but it is NOT ok to think it is ok to mock and be bias to people that are different from them!!! This is not about being petty or overly sensitive...this is about speaking up when it matters, especially as Asians. Around 11:30pm, Chau updated her post to inform people that the restaurant's manager, who identified himself only as Rocco, posted an apology on Cornerstone's official Facebook page. Although Rocco does not name the employee who wrote the slur, he did write that she was fired. "It definitely does not reflect the way the Cornerstone staff or I think because of one individuals stupidity," wrote Rocco in the apology post. "As manager I still take full responsibility and I humbly asks for forgiveness to all who got offended , but most of all to the person who's heart was broke and made sad today. This deeply grieves me. Anyone who knows me and the staff knows that our main role everyday is to see people enjoy themselves and to leave Cornerstone happy. And that we are not racist to anyone. I really love everybody." Everyone, let's be civilized now. There are many people that are employed by the restaurant whose livelihoods depend on their jobs there and should not suffer because ONE IGNORANT employee thought it was ok to make a racist remark. This just one of many incidents of people putting racist sh*t on receipts, although it is much more common for the server to be on the receiving end of the hate like in these stories covered by Someecards in the past. But that is not always the case. In 2013, an eerily similar story to the one above went viral after CVS employee put the name "Ching Chong Lee" on an Asian woman's receipt.